Dennis Gene Murray was born at Fort Jackson, SC and along with both of his parent, both preceded in death Mae Faulkner (US Army Corps), and William J. Murray (US Army), and his three brothers moved back to Washington state. As a family, they lived and grew up in Midland WA. Eventually, his older brother married and also served in the military. When his father passed away, his mother was left with limited funding as a surviving military spouse, so as work ethics go, Dennis quickly jumped in to help. That is who he was. He mowed lawns, cleaned gardens, gutters, painted homes, cleaned barn stalls, washed and detailed cars and gave all his earnings to his "Mama". 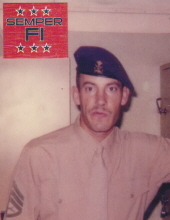 Dennis graduated Franklin Pierce High School in 1973 and joined the United States Marines. Even then, he sent the majority of his earnings back to her. During that time, in 1975, he married his first wife. They had a daughter Tiffany, (deceased) and son Eugene. Dennis, later divorced and everyone moved on. In 1973 while serving as a Staff Sergeant in the Marines he was a Correctional Officer and Tank Crewman until he got out in 1986. Wanting to now have a retirement, he joined the US Army in 1986 and served as a Sgt First Class as a Dining Facility NCO and Field Cook until he retired in 1993. He also served in Korea on the DMZ . Again, not giving up on his work abilities, Dennis was now a civilian. He applied for a WA state job and was trained at the WA State Corrections Academy, graduated, and became a state officer at McNeil Island until it closed in 2011. After that, he worked in Monroe at MICC prison. In 1997, to his surprise, his high school sweetheart, Arlene, had been searching for him over the years and they finally reconnected. She was a military widow at that time. Like Dennis without knowing it, both married in 1975 to someone else and life moved on. With the two "lovebirds" now being reunited as adults, they decided to be a couple, dated for many years and finally married each other. They shared a love and dedication to one another that not many understood or have ever experienced. They were truly blessed. Over the years, they were silently connected in their thoughts and prayers and also in close proximity because of their military travels. The two were soul mates with an adventurous side of their new lives together and attempted to make up for lost time. Some even say, they balanced one another with their personalities. Both resided in their home in Graham ever since and lived a "happily ever after fairytale story". This was a long life love story that could never be denied. Dennis will be remembered by many and missed dearly. Rest in Peace. To send flowers or a remembrance gift to the family of Dennis G. Murray, please visit our Tribute Store. "Email Address" would like to share the life celebration of Dennis G. Murray. Click on the "link" to go to share a favorite memory or leave a condolence message for the family.